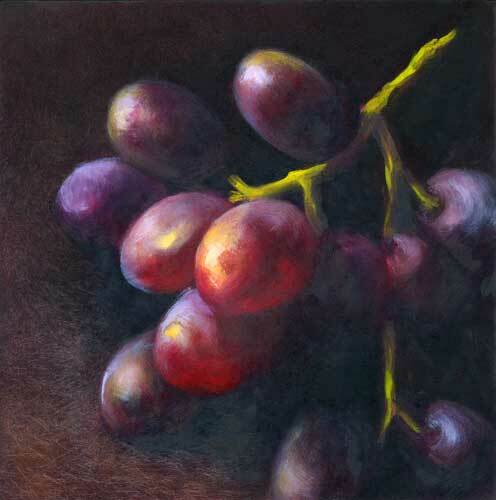 Chardonnay Cluster | oil painting | 7x5"
I realized that although I have painted a lot of red grapes recently, I have never tried to paint green grapes. This is almost certainly because I rarely eat them, and they are not hanging out in the fruit bowl waiting to be admired and inspirational. So this will be the first of a few green grape studies...are they green or white grapes? White Peach in Burgundy | oil painting | 5x7"
I loved painting this juicy white peach, trying to capture the delicate colors glowing on the fresh cut flesh and the soft fuzz of the blushing skin, all whilst the fragrance of warm peach wafted through the studio. Do you stir early or late? 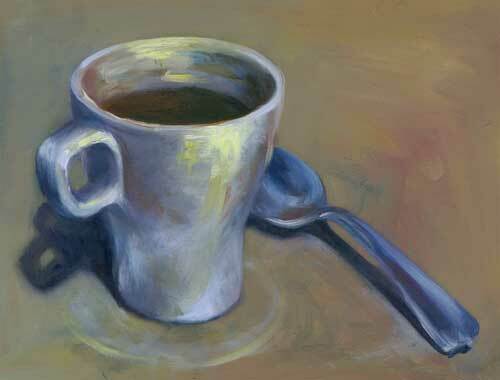 Morning Stir : oil : 9x12"
With this painting, I wanted to capture that time of the day when all you can focus on is the hot cup in front of you, its aroma gently rousing your brain to bring the rest of the world into focus. Sometimes that time of day is 6am...sometimes it is noon...and at this time of the year especially, it sometimes involves a pounding headache and a bit of a delicate stomach. I was trying to catch the exquisite pleasure of munching fresh figs - a fairly recent discovery for me. A Christmas packet of squashed-together-figs and a barge of dried dates were always knocking around the fruit bowl well into the New Year, when all the satsumas were long gone. But they were the dried-up golden variety. Are you sure the paint is dry? 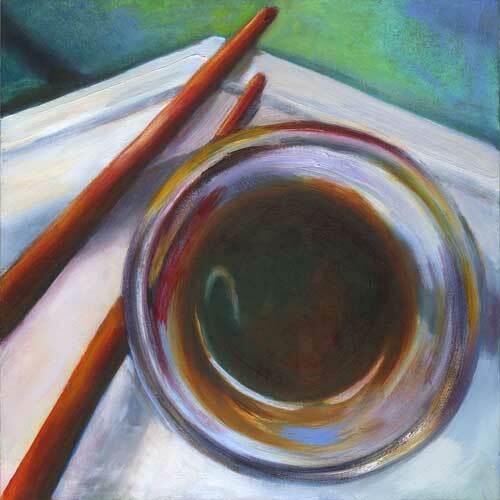 The paint on this wee still life study barely had time to dry before it was whisked away to a new home last Sunday. Would that the day had been slightly drier also! A big "Thank you" to all who braved the elements- not so much the glorious fall sunshine as promised, but more the persistently moist mists of autumn. I think all my upcoming shows are indoors from now on! Not Mushroom in Here - so stop by early! 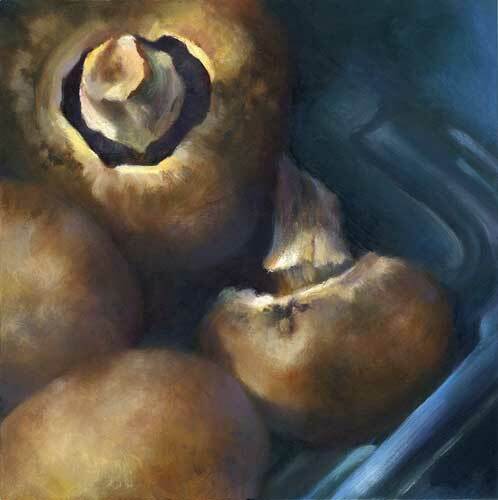 Baby Bella mushrooms still life oil painting 8x8"
Unlike yesterday, today we will have A/C, fresh ice from the freezer and I can at least get a caffeine fix on a regular basis with Dunkin Donuts just across the road. Might have to indulge in a doughnut or two throughout the day. Stop by 1978 Gallery today to see 6 splendid local artists doing their thing. I love Joy Yagid's new amazing owl photos...and she has a very scary wall of eyes! Florence Wint's wall is joyful, with crazy color, sparkles and fun. Evelyn Graves' jazz inspired collages are so cool you can hear the music in her pictures. Luis Alves collages may be thought provoking, but they usually make me smile whilst my ideas of fashion and beauty are being gently tweaked and tested.